Formerly Engine Company 104 of the Chicago Fire Department, the Chicago Firehouse Restaurant is applauded not only for honoring and preserving the original 1905 Romanesque Revival architectural design but for its unwavering commitment to the building’s purpose since its inception: service. A beloved cornerstone structure in the South Loop neighborhood for nearly 112 years, the bones of this “home” are a living narrative of a family of firefighters serving and protecting its community to a stately restaurant that honors and embraces this century-old mission. From Chicago firefighters and Chicago socialites who built homes in this neighborhood at the turn of the century to a Chicago family restaurateur, all who serve others in this establishment embrace the spirit of family and are dedicated to serving the community. The culture of the past continues to serve the present in this iconic landmark. At the turn of the century, Charles F. Hermann designed Engine Company 104’s firehouse with architecturally unique details that kept the structure in good stead with prominent families including the McCormicks, Palmers, and Glessners who resided on Prairie Avenue from 17th to 20th Street. 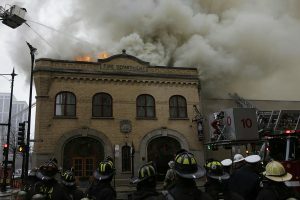 When the Chicago Firehouse Restaurant opened its doors in 2000, during the renaissance of Chicago’s South Loop, it was tirelessly attentive to preserving the significant architectural elements which engender the renowned Chicago landmark status. Inimitably indigenous to the era and community’s eminent homes is the noteworthy elaborate yellow brick and limestone façade framing the floor to ceiling arched windows on Michigan Avenue. Originally constructed as doors to accommodate horse-drawn fire-fighting apparatus, these windows invite patrons to peer into the past while experiencing exceptional food and service. Guests enter the two-story structure through the original firehouse personnel entrance on the corner of 14th street. Pointed historical features and well-defined ambiance offer dining options. The focal point in the distinctive bar room is the horseshoe-shaped bar; history lives in the original, tiffany glazed tile lined walls and the intricately replicated 12-piece tin ceiling design. Enhanced by the sidelights and transom incasing the historic arched windows, natural light blends with softer illumination to create a comfortable, relaxed setting offering a bar or full menu. Two main floor dining options extend past the bar room. A refined dining experience is offered in a setting depicting history through a turn of the century mural. Complementary wood coffered ceilings and tailored, leather booths nestled alongside formally dressed tables set the tone for fine dining ambiance and elegance. Equal to the exceptional experience in the mural landscaped room is the fine dining option in the sun-drenched solarium room. Natural light pours through the floor to ceiling windows illuminating fully donned tables and energizing this extraordinary space. Accentuated by plantation shutters and decorative floor tiles, this option is perfect for brunch or a dinner enhanced by the glimmer of Chicago’s night lights. In addition to the first-floor dining options, the Chicago Firehouse Restaurant plays host to incomparable private dining and service in 3 intimate rooms located on the second floor. History did not escape the restaurant renovations of the former firefighters’ sleeping quarters and handball courts. The floor to ceiling paneled Mayor’s Room offers a quaint, warm charm accommodating 12 guests for a special occasion. The room is set aglow by an 1872 vintage fireplace adjoining The Mayor’s Room with the Palmer Parlor. The Palmer Parlor flows into the Kimball Parlor, both named for notable community residents of the 1900’s, to accommodate larger private dining parties or each Parlor can stand alone for parties of up to 60 guests. Adjacent to the Kimball Parlor is the Veranda overlooking the Chicago Firehouse Restaurant’s brick-paved patio. The Veranda seating offers a unique experience at its best while savoring Chicago’s breathtaking skyline. As attentive as the Chicago Firehouse Restaurant is to preserving the historical relevance of the structure, so too is it committed to the authenticity of a traditional steakhouse. Organic to its roots, the structure and menu are designed to reflect uniqueness, thoughtfulness, quality, and relevance. The quintessential steakhouse menu is exceptionally complimented by timeless house favorites and distinctive, contemporary seasonal dishes that pique the palate with unmatched savor and interest. Succulent steaks precisely finished with a tasteful hint of seasoning can also be garnished with a selection of sauces embellishing the natural flavors of the dish. Longstanding culinary excellence is exemplified by refined flavors, artfully trimmed plates with the freshest ingredients, and impeccable, gracious service. The past endures the present when time-honored, quality dishes revere ritual and innovation. The Chicago Firehouse is fortified by standing on the foundation of its history and its purpose. Even when the restaurant’s devastating roof fire forced the historic doors to close on December 10, 2014, it did not extinguish the passion to rebuild this renowned city landmark. While the roof was engulfed in flames, a family of Chicago firefighters stood among the neighborhood family and alongside the restaurant family vowing unequivocally to support the restoration of the Chicago Firehouse Restaurant, a pillar in the community. A fitting testament to its roots and reputation, loyal patrons poured into the revitalized Chicago Firehouse Restaurant on February 3, 2017, and most of the former employees rushed to warmly welcome guests and serve a customary, exceptional dining experience. A legend in its own time, the Chicago Firehouse Restaurant’s family hospitality is the hallmark and service is the untiring culture.